A Google Business Help thread has several complaints from business owners that when they try to verify their business listing within Google Places / Google+ Local they are greeted with a 403 server error. In other words, the server is refusing to allow the requested action - i.e. the verification. Why? Probably some sort of bug, to add to the list of other Google Maps / Local bugs. I created the above page for a customer. 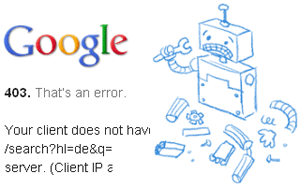 The page is made but when I click on the "Verify Now" link to verify the listing, it take me to the Google error page. There are several "me toos" in the thread or in other threads. Google's Jade Wang moved the thread to the top of the forum and is asking users to post more and more examples in the thread in order to take those details to the engineers. Can you all please post links to the pages where you're experiencing this? You can never get tired of these bugs.